I go through tons of tape and have been collecting the carboard tubes in the centre. Finally, I found a great way to recycle these cardboard tubes to make beautiful storage containers. This one is for my daughter's earrings. 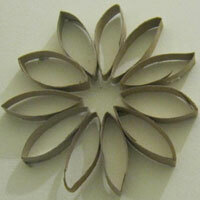 This is a fantastic way to upcycle all your old toilet rolls - create beautiful flowers to stick on your bathroom wall! 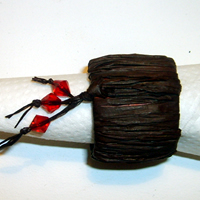 Use your old toilet rolls to create beautiful and practical serviette rings! Cardboard is the most predominant source of packaging worldwide, and makes up an average of 25% of household waste annually. It is therefore incredibly important that we, the consumers, make every effort to recycle it, as opposed to just turfing it out to be used as landfill. Cardboard is biodegradable, and, as it breaks down it produces Methane - a greenhouse gas which is a major contributor to global warming. So by recycling it, we save space and assist in preventing harmful emissions into our atmosphere. There are two types of cardboard. The first of these is also known as boxboard, which is the solid sheets used for products like shoe boxes. The grey colour of boxboard is a good indicator that boxboard is made from recycled material as it gets its colour from combining various papers which may have had ink on it in a previous life. The second, and more common type of cardboard, is corrugated cardboard. This is made up of two linerboards separated by a ribbed inner layer, known as a medium. This is the type of cardboard we will be concentrating on today. After the recycler has collected the old cardboard boxes from the drop-off point or kerb, the material is generally sold to a paper mill. At the mill, the old corrugated cardboard is pulped and blended using additional wood chips. Shorter and weaker fibres are blended together with the new pulp to make the medium, whilst recycled paper fibres and new pulp are mixed to create the linerboard. Once done, the mediums and linerboards are shipped to a boxboard plant that completes the manufacturing process. The mediums are corrugated by specially geared machines, the linerboards glued on and the resultant flat pieces, called mats, are trimmed to size and creased along a pattern of folds. These mats are then shipped flat to customers who build up their boxes. Types of cardboard that are easily recyclable include egg boxes, cereal boxes, stationery, greeting cards, pet bedding, toilet roll holders and boxes of all sizes. By recycling, you are making a difference. TP – as we affectionately call it – is a big part of most of our lives. And so you can imagine that a lot of production and therefore ecological damage occurs due to our unending demand for it. It's alleged that one tree produces about 45 kg of toilet paper. The average Westerner uses about half of that per year, meaning that that one individual destroys one tree, on average, every two years… which doesn't sound too bad until you consider just how many individuals there are out there! In total, roughly 83 million rolls of toilet paper are produced for our consumption every day!! Paper mills are a large source of air pollutants, such as carbon dioxide, nitrous oxides, sulfur dioxides, carbon monoxides and particulates. These pollutants contribute to ozone warnings, acid rain, global warming and respiratory problems. Many paper mills are large enough to have their own coal-fired power plants, which raise additional concerns about mercury, arsenic and radioactive emissions. Paper making also requires a lot of energy; it draws large amounts of electricity from public utilities or mills are forced to build their own power plants. Either way, the manufacture of paper once again contributes significantly to the air pollution. In addition, paper making uses a great deal of water, to a point where it frequently diminishes groundwater supplies. But the reality is that we need it. We can avoid being wasteful with paper in general and when it comes to toilet paper, in particular, we can try to conserve our use of it. A helpful idea is to buy packs offering toilet rolls with the most sheets on them (per roll) as you will consume less and less of the rolls. Luckily we can recycle, reuse and repurpose the leftover toilet roll in order to lessen the demands we make on our earth to produce it. Paper has fast become the most recycled waste. Fortunately, many governments and affiliated organizations have made it much more convenient for us to recycle toilet rolls. But there are also many fun and creative ways we can repurpose them. In fact, the toilet roll and the potential it has for repurposing makes it a true recycler's dream!! Many people add their empty toilet rolls to their own personal compost heap. They are also handy as ad-hoc firelighters. If one end is stoppered with newspaper, for example, they can be used as temporary containers for seedlings. Because they are bio-degradable they are the perfect first home for a tiny seedling seeking some protection. The toilet roll is a child's craft dream!  Donate any spare rolls you collect to a school or crèche near to you. The possibilities for arts and crafts are endless – you can make dolls, instruments (such as makeshift rainmakers and tambourines, additionally with the larger kitchen paper rolls) as well as a feather and string covered toy for kitty! More adult targeted crafts would be wall decorations, bird feeders, napkin rings… The potential is there, you just have to think about it. And you know what they say one of the best places is to think……? You guessed it! On the toilet!